On this page, you will find a new set of rules being placed for Yards, a guide on how to make a yard, and a glossary of all the yards listed on the PBA Yards forum. This has been long overdue. These are subject to will change over time. • Scamming is not allowed. At all. i.	Scamming is engaging in fraudulent activities to gain money, items, information or Pokemon from another person. ii. Protect yourself from scamming and only do business with people you trust. iii. Staff may intervene in scam cases as they see fit. • When you charge x amount of Pokemoney or Pokemon and decide to raise the price of your yard, you are not allowed to kick members out who have paid the first price, or charge them more. Once they pay, they are allowed to stay in for the time they payed for. • Do not lie about the contents of your yard. If you have 500 Magikarp, then say you have 500 Magikarp otherwise this is considered scamming. Be prepared to show evidence of the contents in your yard. • You may not pick and choose who you let in your yard. If you make it public on the forum, you cannot show discrimination. • Do not falsely report someone’s yard for whatever reason. False reports will end up getting you in trouble. • If you ever intend to make changes to the yard price, pokemon content etc that would affect the people in the yard, you need to have it clearly stated in their yard post that you will plan on making changes. It has to be when you first create the yard post, not edited in weeks later. • Read the fine print. Make sure you read a person's yard specifications from top to bottom. They may include a time frame of access, a price, or whatever. Know your stuff before entering yards. • Specify in your yard's topic if you will be giving out refunds in the case of deletion. • Just because a yard is not listed on the forum, doesn't mean it has an exemption to the rules. All yards must follow the rules. • "PBA and PE have a no-account-sharing policy. Any trouble you or your account gets into because you decided to share password(s) is entirely your fault and staff may not help you"
Well, before you can actually build a yard, you need to buy a house. 1.) You should first see this page when you go into the "My House" tab. 2.) For "Style" click whichever kind of house you want. Each style has a different type of house. 3. )For "Location" It doesn't matter which one you choose this is irrelevant. 5.) Then finally, purchase the house for 200,000. Okay, NOW onto building the yard. 1.) Click on "My House"
2.) Click on "Visit My House" it should be near the top. 3.) On the bottom you will see a white box. Click in the box, and it will open a menu containing all your pokemon. 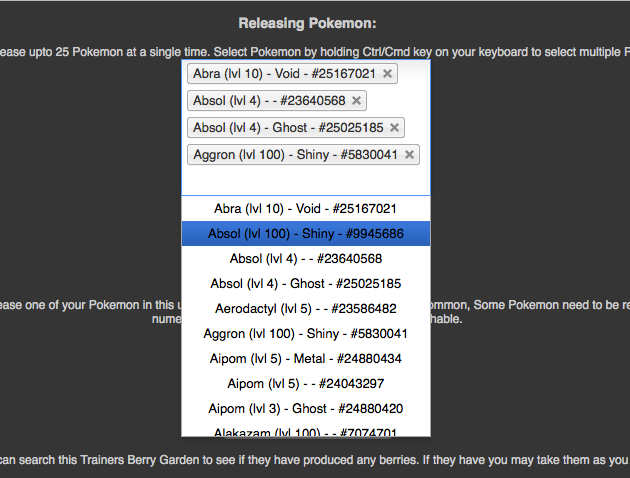 Select a pokemon, click the box again, and select another until you have selected all of the pokemon you wish to release. 4.) You need to click "Release" now. CAUTION: make sure you have selected only the pokemon you want to release into the yard. You won't get them back after releasing it into your yard. Yards that are for Pokemon Elites only, will be highlighted in Blue, with a [PE] sign next to them. I only added the ones who have been updated since last october, many of these may be inactive, if you see someone who is no longer playing or no longer has their yard, please PM me. I will attempt to help with the "Everything to do with yards" part by having a Commonly Asked Questions section. These questions are based off of the yard-related questions people ask on IRC. A: Yards are the essentially personal maps that are attached to your account. You can control what wild Pokemon appear in your yard by releasing Pokemon of your choice to it. Q: How do I get my own yard? A: Go to Trainer HQ > My House to buy a house (it will cost 200,000 pokemoney). Once you obtain a house you can visit your yard through the house page or by clicking on "Visit your house" on your profile. Follow the instructions in the post above to release actual Pokemon to it. Q: My yard limit is 500 Pokemon! How do I make it 1000? A: The account needs to be premium to be allowed 1000 Pokemon. In order to obtain premium you have to donate or have someone donate to that account. Q: How do I visit other people's yards or let others visit mine? A: To visit someone's yard or invite someone to your yard you must both be added as a friend. Some people may require an entrance fee before they accept your friend request. You can not enter the yard of a person you are not friends with. Q: Do I need to release specials into my yard in order to find specials? A: No. You can release all normals and still find all the map findable specials. Some people choose to release specials to yards saying that it does help raise special encounter rates but we can't officially confirm or deny that it works. Q: Can I release any Pokemon into a yard and be able to find it? A: No. There are some Pokemon that will not appear in a yard no matter how many of them you release, such as Seviper and Zangoose. 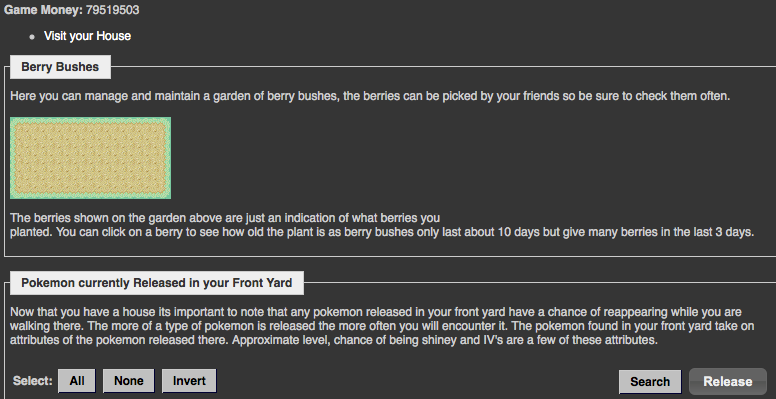 If you are unsure if a Pokemon can be found in a yard, you can ask on the forum or drop by our IRC channels and ask. A vast majority of them are yard safe though, so you shouldn't find a problem with this. Special note for PE players: You can not release legendary Pokemon into yards on PE, legendary-type yards are only possible on PBA. Q: If I release a Pokemon in my yard then catch it in the yard, is the yard now empty? / Are the number of Pokemon I release the only amount of Pokemon that are stocked to a yard? A: Once you release Pokemon to your yard you can encounter an infinite number of them because they are treated as a map spawn (unless it is a Pokemon that can't be spawned in yards). Your yard population on the My House page will not deplete when you or your friends catch Pokemon. Q: How many Pokemon do I need to release into a yard in order to find it? -For the average Pokemon you should release at least 100 of them for that Pokemon to show signs of life in your yard. -Legendary Pokemon are the hardest to find and usually require full yards of 500 to 1000 each in order to become encounterable on a fair rate. -Most recently released 5th gens appear to be super common in yards, such as Sewaddle and Ducklett, and usually need under 100 to max out their yard encounter rate. -Older released 5th gens such as Snivy, Pidove etc have a rarity closer to uncommons/legendaries and are harder to encounter so you will need to release a lot more of them. -Having only a few species of Pokemon in a yard is better than having many. The more species of Pokemon you throw in a yard, the less the total population for that Pokemon will be, making them harder to find. For example: you can have a yard with 1000 Pokemon but if you have 10 different species of Pokemon evenly in there, that means there will be only 100 of each kind. This may be fine for common Pokemon but if you did that with legendaries they will be awfully hard to find.